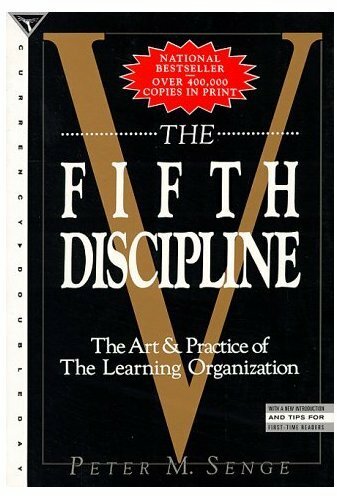 The intriguing premise of The Fifth Discipline is, that a companies' only sustainable competitive advantage is the ability to learn faster than its competitors. Senge names companies who follow this approach "Learning organizations". He makes it clear that you can never actually be a Learning Organization, as it is a neverending process, more a state of mind. Senge identifies five disciplines that help us build the Learning Organization: "Personal mastery", "Mental models", "Building shared vision", "Team learning", and "Systems thinking". For me, "Personal mastery" is more or less what Stephen Covey describes in his book "Seven Habits of Highly Effective People", you can read my previous blog entry about it. I liked the way Senge says people with a high level of personal mastery approach their life like an artist approaches a work of art. They have intrinsic motivation and are deeply committed to what they do. "Mental models" are the way we view the world. There is no truth, only our perception of the world. We need to let go of the assumption that what we see is "the truth". Only when we are aware of this we will be able to explore other people's opinions without prejudice. "Building shared vision" is about forming a collective vision from personal visions. Only a vision has the power to give us long term motivation, it is a picture of a future we seek to create. The challenge is not to dictate a vision, as this will at best lead to compliance. What you want are truly committed people, who truly embrace the shared vision, as it if was their own. In order to understand "Team learning", you need to be aware of the difference between "dialogue" and "discussion": Dialogue is about exploring a topic, and opening up. You let go of you own mental models, and enter a process of genuine "thinking together". Through dialogue you will be able to see things you would never have seen on your own. In contrast, discussion is a process of decision making, it's a process of weighing arguments, with one argument being the winner. Dialogue is about opening up, discussion about narrowing down. You need to know when to go to dialogue mode, and when to return to discussion mode. Continuining with "Systems thinking", Senge says that our world view today is fragmented: We are a society that produces specialists, who are used to address a tiny segment of a bigger system they don't have to understand. In computer science we call that paradigma divide-and-conquer. But reassembling the fragments into a whole is a complex process, so we either stop trying or end up with a distorted "big picture". We see the world as a chain of events, not as a complex system that produces these events. So we often find ourselves solving problems by removing the symptoms, without trying to see the system's mechanism that produces these problems. "Systems thinking" is the fifth discipline, giving the book its title. it incorporates all other disciplines. "Building shared vision" fosters thinking long-term. An understanding of "mental models" helps us to to be willing to see the system, while "team learning" actually helps us to see the system. "Personal mastery" helps us to reflect and see us as part of the system. After all, a Learning Organization is not something abstract or remote: humans are really learning machines, learning gives us pleasure, it lies in our nature to learn. The concept of a Learning Organization helps us to model an organization after the people who form it, and not vice versa. Peter M. Senge also wrote the foreword to the book "Sustainability by design", which I reviewed earlier this year. Make sure to get the revised edition from 2006. It contains a lot of real world examples of organizations that applied the techniques mentioned in this book. You can buy a copy here, or lend my copy, just ask.